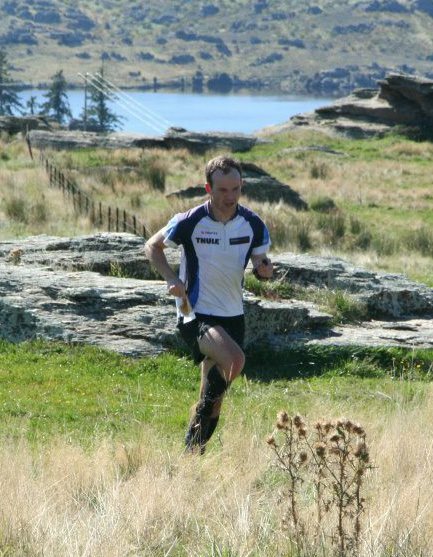 Had a good birthday present this year, two orienteering races in one day in Central Otago. Couldn’t have asked for a much better present! So after work on Friday night we jumped in the car and headed south. It was a long drive with a few quick visits along the way in Temuka and Tekapo. Eventually late Friday night/Saturday morning we reached out destination for the night. The old Lindis Hotel. It was a very cold night, but when the sun came up it was a dead calm and clear morning. Just a short drive and we arrived in Cromwell all ready to sprint. Ryan had a new map and a new course for us. It was a cool little sprint, hard work with lots of route choice and fast running. I took my first victory for the weekend, by about 30sec over Carsten. Next up only a couple of hours later was the Middle distance at Bannockburn, the scene of the 2012 Middle distance at Nationals. It was cool to get back onto that map, really fast fun and fairly technical. Unfortunately I had to settle for second after making a few silly mistakes which disrupted my flow a bit. Steak was the prime choice for dinner that night in Alexandra…which was needed for the next day. The long distance was again held at Earnscleugh, up in the rock out in the open. I was out for revenge, and ran a solid race to win comfortably by 13mins…helped along a little bit by the course planners who accidentally planned at the wrong scale and as a result the courses were 50% longer than they should have been! Approaching the Finish...finally after 18.5km! The sun shone and it was a pleasant drive back home through some of the coolest areas of NZ. All in all a good weekend away.